The Compulsive Reader: Happy Birthday, Beverly Cleary! Happy 100th birthday to a living legend, Beverly Cleary! I have some vague memories of reading the Ramona books when I was a kid, but my best memory of her work was discovering Dear Mr. Henshaw in third grade. I am pretty sure it was the first epistolary novel I ever read, and I fell in love with the form. That book sent me along to many other books I came to adore (ahem, every Dear America novel ever written). 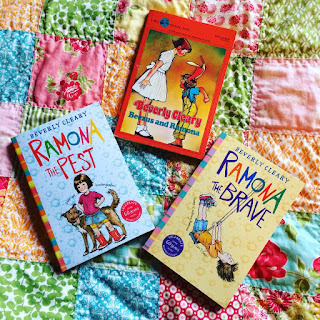 Ever since reading the most recent issue of the Horn Book, full of tributes to Beverly Cleary, I've been re-reading (and in some cases, reading for the first time) the Ramona books. As withs many great children's novels I've read as an adult, I wish I had read them all when I was little, because I know I would have adored them. But I'm grateful to have gotten to them eventually, even if I am no longer the target audience. They've awoken memories of being a kid, and memories of how I once viewed the world. And if anything, I'll be more than happy to pass them along to other kids I know. So, happy birthday, Beverly Cleary! Thank you for everything. I think her books were among the first I read as a kid! The first book I read by her was Mitch and Amy.